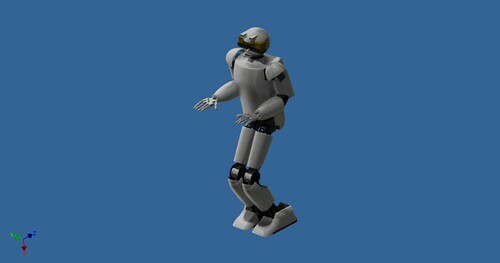 Today I bring you some pictures of how we are expecting the robot to look like with his shell on. Some of the colors have been changed to make the robot look better. Today we started a new variation of the hand. 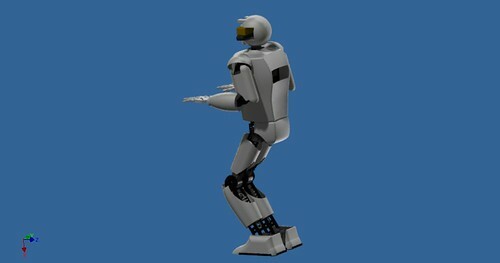 Initially we took design inspiration from InMoov project and the beautiful mechatronics hand designed by Gael Langevin. 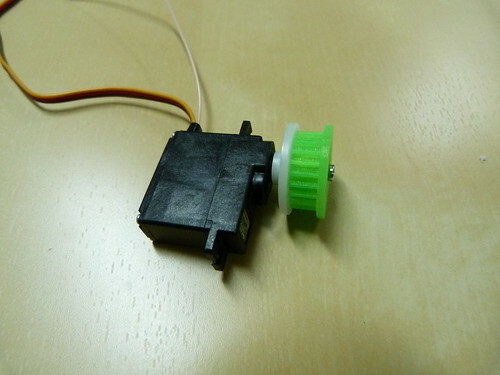 However, his design involves every servo actuating the closing and opening of the hand. We had some issues in calibrating and repeatability in this type of actuation. Instead of the fingers being actuated by the servos when opening and closing, they are just actuated when closing the hand. 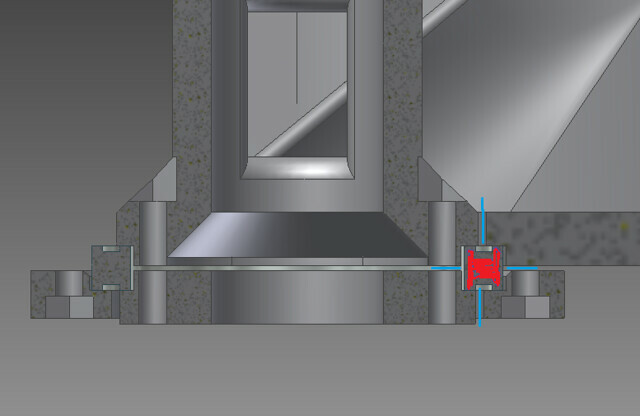 The hand's resting position is open by use of torsion springs in order to bring them back to open. 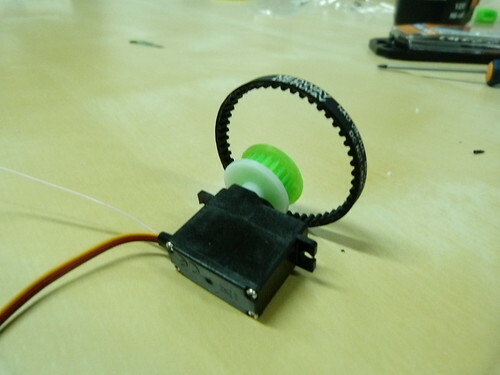 We are thinking on using a pulley and timing belt system to rotate the wrist up and down. i7 isn't that expensive so might as well. Is there a need for that much power? What battery is going to drive all that? It's going to be huge I bet. Can get some ideas from this Tosy robot from Vietnam featuring at CES. We are using 2 5000mAh batteries. The i7 board takes about 6A at full load. One battery should be about 1h runtime at full load. The video pretty much speaks for itself so not much more to say. Still not all the springs and mechanical stops implemented but enough to get a feel for how it works. A bit more work and it should be good to go. Already planning on how to add FSR for touch sensing when the mechanical aspect is resolved. We did 1000 cycles to test durability. Not even slight damage visible. 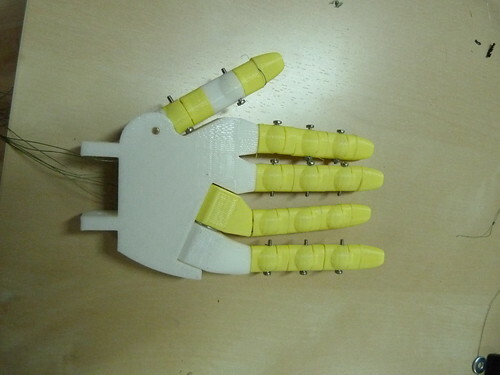 To add a sense of touch to the robot we are adding FSR's to the fingers. THE FSR's have a connector with a thin transparent plastic where a conductive trace seems painted on and covered with protective varnish in the smaller version and a sort of tape in the larger version. Since we want to place this in small fingers we want to get rid of the connectors. 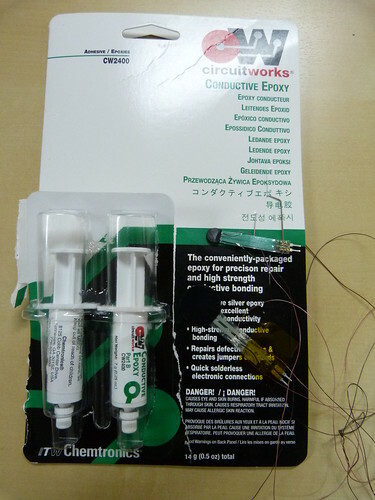 I did a test to check if soldering was possible to the conductive trace. Not a chance. The plastic layer melted away as soon as the soldering iron touches it. It's a two part component like normal 5min epoxy but it is mixed with silver particles which makes it conductive (and expensive). Promising results. 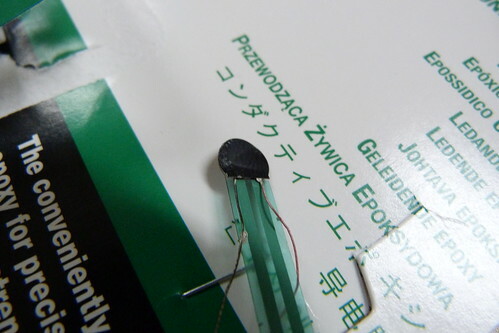 The epoxy seems as strong as normal epoxy and electric resistance is negligible. 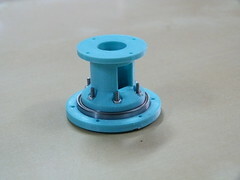 We are using very thing (36AWG) teflon coated copper wire. Abrasion resistant and very flexible. The fingers were designed with channels to run these wires inseide. 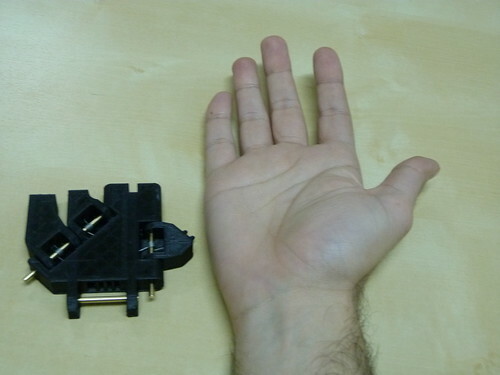 We manage to pass cables for 3 sensors in one finger and it still remained easy to flex. 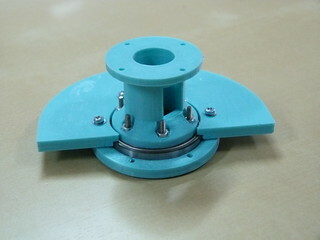 Today I bring you some pictures of the mechanism that will allow rotation of the forearm. This rotation will simulate the roll movement of the wrist, but it's applied near the elbow due to organization of the servos inside the forearm. 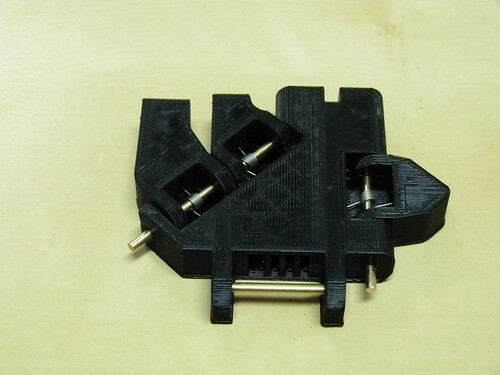 It consist basically on a 3D printed tube attached to the horn of a servo on one side and attached to the elbow metal frame on the other side. It has to be a tube in order to allow cabling from the main controller to the forearm and power cables. 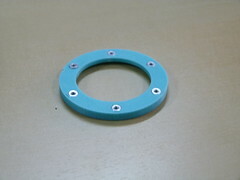 Arround that tube there is a bearing and the forearm is attached to the outside of the bearing. 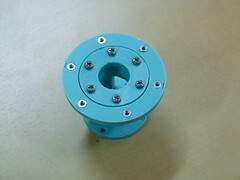 The tube thats attached to the servo, the bearing and a part that keeps the tube tightened to the bearing are shown in the following picture. 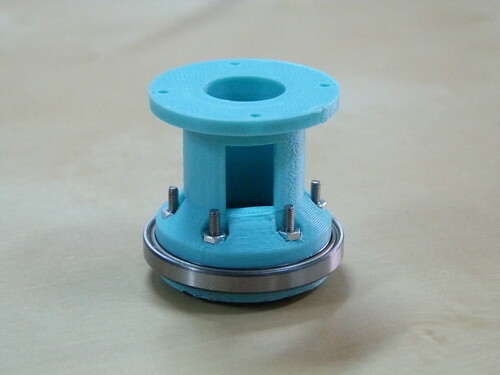 It is not the full foream, just half disc to test if all the dimensions were correct, and if the mechanism works as expected. Can you post more info about the bearing? It looks like those bolts right through it. How does that work? The trick here is to use a standard bearing (http://www.bearingboys.co.uk/61706-2RS_Thin_Section_Ball_Bearing-82609-p) in an unusual application. 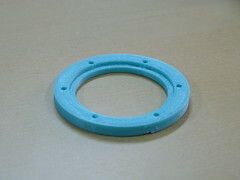 you get that illusion because we placed the screws very close to the inner and outer edge of the bearing. Red is the bearing and blue is open space. 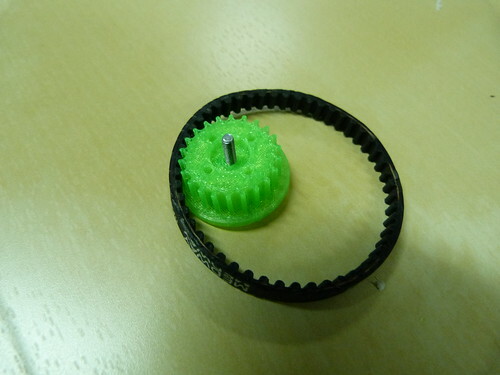 The stationary part grips the inner ring and the rotating part grips the outer ring. (Didn't have the parts quite aligned so the top portion of the screw hole does not show up). I see now. Very cool. Kinda reminds me of a Freestyle BMX detangler. Another large update on the hand status. First try of fully assembled system. The system is being controlled manually with a Arduino compatible board . Still some adjustments to me made in finger angle and rubber like texture to grip objects but still a very nice functionality.